Whilst every month is organic month in this household, I do like to support the #OrganicSeptember campaign. I have always been a strong believer in organic food, not so much for the health benefits, although that is important, but for the environmental ones. Growing food organically is the least harmful way of meeting human needs whilst allowing insects, birds and other wildlife to survive. Organic food doesn’t have to be expensive; we live on a pretty tight budget. I buy some of our staples such as oats, rice, lentils and dried fruit in bulk which reduces the cost considerably. We also grow many of our own vegetables. Just buying one or two regular items that have been produced using organic ingredients can make a positive difference. Certified by the Soil Association, Seed & Bean are officially the UK’s most ethical chocolate brand. 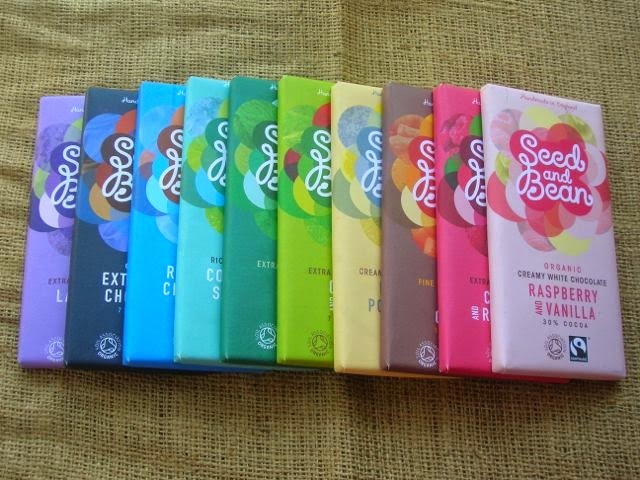 Their bars are organic, fair-trade and ethically produced. They are the only company to score 100 out of 100 in the good Shopping Guide’s ethical index. They have a direct relationship with their cocoa bean growers in Ecuador, the Dominican Republic and on the Sao Tomé Islands off West Africa, ensuring a better income for the producers and a more sustainable crop. As you would expect from a good quality product, all of their ingredients are natural and only real fruit is used. Founded in 2005 by principal chocolatier Stephen Rudkin, the bars are still handmade in small batches in Northamptonshire. I was particularly pleased to find that the inner “foil” wrappers are actually made from something called nature flex which is fully home compostable. I wish I’d known about this before, but the message doesn’t seem to be anywhere on the wrapping, which is where it probably should be if they want people to compost rather than throw. The Seed & Bean range is currently made up of eighteen different flavours, including seven award winners. The two most recent award winning bars are an extra dark (70%) with Cornish sea salt and a rich milk (37%) with Sicilian hazelnut and almond. I have reviewed the former, but have not had the pleasure of trying the latter and sadly it wasn’t in the bundle of ten I was recently sent to try. Some other flavours I’d like to try but weren’t included are the dark chocolate (58%) lemon and cardamom, dark chocolate (72%) pumpkin seeds and hemp oil and the milk chocolate (37%) tangerine. Twelve of the bars are suitable for vegans. Interestingly, I noted from a previous review of the milk chocolate Cornish sea salt and lime that the cocoa content has gone up from 30% to 37%, which in my book makes it even more delicious. In fact the four milk chocolate bars all have a cocoa content of 37%, which although I’d prefer to be higher still, is much better than most chocolate bars you’re likely to come across. Whilst my mouth waits with anticipation to savour the inner secrets of the bars, my eyes feast on the multi coloured outer packaging – a veritable rainbow of colours. The graphics are eye-catching and the colour of the wrapper reflects the flavour of the bar. Really I don’t think I can improve on their own words: “we fill our days with the soulful pursuit of creating kaleidoscopic moments of pleasure”. Of the ten I was sent, some have been reviewed on the blog, some I’m planning to bake up a storm with and two I couldn’t resist trying out almost immediately. You can see which ones those were below. You can find Seed & Bean bars at various independent shops around the UK, Ireland and Europe. You can also buy them direct via their online shop. The bars weigh 85g, all but the milk chocolate and the dark chocolate bars which have recently gone up a size and are now a hefty 100g. They all vary in price but cost around £2.30. Coconut & Raspberry (66% dark) – cocoa mass, raw cane sugar, cocoa butter, coconut oil, raspberries, soya lecithin, vanilla extract. With its subtle flavour of coconut and fruity taste of raspberry and a backdrop of smooth dark chocolate, this is really rather wonderful. It’s a combination I’ve not come across before, but it works very well. The raspberry leaves a tart and refreshing taste in the mouth. Whilst the chocolate is smooth, there is texture from the powdered raspberries which makes me want to munch rather than savour. For a dark chocolate, this is really rather moreish. Chilli & Lime (72%) – cocoa mass, cane sugar, cocoa butter, vanilla extract, chilli powder, lime oil. Lime is the first flavour to hit the senses; a rich aroma of lime and chocolate emanates enticingly from the bar and when the chocolate touches your mouth, it is lime you can taste. It doesn’t take long though for the chocolate and spice to catch up and gradually your mouth fills with the warming power of chilli. I found the balance of both lime and chilli to be just right. Both were noticeable, but neither overwhelming and they worked in tandem with the smooth dark Dominican trinitario chocolate to give a particularly pleasurable experience. This chocolate is rich though and a couple of squares at any one time is enough to satisfy. Thanks to Seed & Bean for sending me some chocolate bars to try out. I was not required to write a favourable review and as always, all opinions are my own. Love the colours and what great flavour combinations, I reckon I would have chosen those two to eat as well! wow! I’ve never heard of this company before but it looks brilliant! I need to try some! raspberry and vanilla sounds amazing! yum! Love that first photo with all the colours. The range of flavours is very impressive too! What a rainbow of colours…… Someone had a good marketing head on when they designed those! I love the sound of the lemon and cardamom…. What a colourful array of chocolates, in an assortment of colours. I especially like the idea of the chilli and lime. I haven’t come across this brand before but they sound fab and I’ll definitely be keeping an eye out for them. Love the sound of lemon and cardamom! These sound so great! I can’t wait to find some! These all look delicious but I would love to try that Chilli and Lime! !